A good quick explanation of the what the Shroud of Turin is telling us. I attended Breault’s presentation in Skokie, IL on March 7. Great job! He covered all the bases. It was very credible. No presentation on the Shroud is complete without a discussion of the evidence debunking the results of the carbon dating tests done in 1988. No less than Ray Rogers, a scientist and leader of one of the teams doing the carbon dating, showed later how the results of the tests were flawed, and,therefore, meaningless, since the tests were done on a patch sewn into the cloth in 1532. Russ Breault’s emphasis on the Message of the Shroud, succinctly summarised in the Lauer paragraph extract above, is truly what matters. It is too often muffled in the perpetual pointless authenticity debate which too often preoccupies the correspondents on this site to the detriment of the true message. The masking of the message by endless raucous debates which are always inconclusive, is one reason why I have lately seriously considered withdrawing from the site. I too hope you stay…but disagree with you on the “message of the shroud”…the message has always been there…but the question on may of our minds is whether God has left something behind for us…I don’t know if it’s real or not, but at least that’s the message I want to know,,,come on daveb!…we need you here! Rick, I almost always tell people that I am 90% certain it is authentic, I will always give 10% to the possibility that it is the work of some medieval artist who predated Leonardo by several hundred years, we don’t know who he is, we don’t know how he did it, and he never did anything else of any significance. I guess that is possible but not very likely in my opinion. As far as whether Jesus left something behind, he surely did. In fact it was the “linen cloth lying there” that was the first piece of evidence that Jesus rose from the dead. The only question is whether the Shroud of Turin is the same cloth. agree Russ..have been watching your presentations online on youtube….excellent…..I actually agree with you for the most part…just don’t want to get my hopes up! Daveb: Breault is very emphatic about his beliefs that the Shroud is the authentic burial cloth of Christ. Yes, he talks about the message in the Shroud, but he doesn’t back off from the skeptics and doubters including the scientists, and that’s because he has the facts and the science to back himself up. He is not running from a debate. He is participating in it as well as demonstrating his belief in the message of Christ. I am with him on this. I tend to be skeptical myself, but when the evidence in favor of one argument over another hits me square in the face overwhelmingly, then I have no choice (if I’m a reasonable person). I owe it to myself to admit what I might not like to admit. 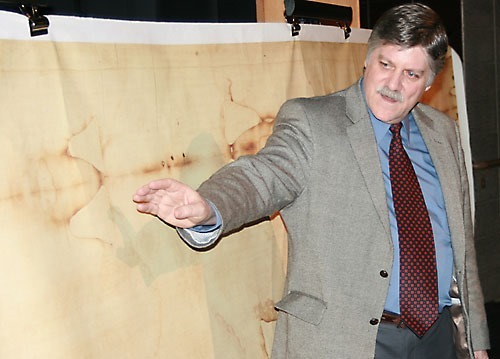 Breault passionately believes the Shroud is authentic, and I do as well. I could care less whom I might offend. On behalf of Centro Português de Sindonologia I sincerely hope you give up your purpose of withdrawing from this blog. You are a serious Shroud researcher and your comments are always very wise and we all learn a lot with them. @Daveb of Wellington NZ, Don’t leave – I just ignore the naysayers. It seems that there will always be those either through ignorance or design. If by ignorance – they need help learning and if it is by design then the evil needs people against them sowing the public just what they are. One skeptic says it is a painting. He says so, because he doesn’t know the difference between a painting and a negative photographic image. Other skeptics do not know how the image was formed. Some says it is a scorch. No one even Christians do not know what was involved in Resurrection Process. So without telling us how it was formed they tell us it is a fake. No one can produce any other image similar to image on shroud of Turin or can produce any other image which was produced in 14th Century or even 21st Century. Furthermore these skeptics can not understand the difference between Grab sample and composite sample. They don’t know what is the meaning of represetative sample. Even they don’t know what is the meaning of contamination. So Daveb please don’t give up. I have learnt many from you. Hope to learn more in the future. Remember I’m one of these skeptics. One of the ones who does “not know how the image was formed.” Do you think I cannot “understand the difference between a grab sample and composite sample”? Do you think I “don’t know what is the meaning of representative sample”? Do you think I “don’t know what is the meaning of contamination”? I too have learnt much from daveb. I hope he continues to defend his corner in the face of genuine inquiry and difference of opinion. If I had not had flaws in the authenticist argument pointed out to me, I would never have explored the statistics of radiocarbon dating, and if I had not had flaws in the non-authenticist argument pointed out, I would never have discovered as much as I have about Three Marys iconography, and they are only two examples of the wide variety of fields of knowledge which have been opened to me by reading the posts of those whose opinions differ. From disagreement often comes progress, from agreement often comes stultification. Do you believe Image on Shroud of Turin was produced in 14th century based on Carbon Dating results of the shroud? According to your opinion how the image on Shroud of Turin was produced or formed? On balance, I have to say that my current inclination is that the Shroud is medieval. Anybody reading anything I have written will know that I have neither ignored or dismissed any of the contrary evidence, but rather weighed it all up carefully, and on balance feel that the radiocarbon date cannot be rejected. I am not so convinced of my opinion that I hurl abuse at anybody who disagrees with it, and I am even less clear how the image as it appears today arrived on the Shroud. I have long tended towards some kind of imprinting process, and long felt that that its precise appearance may have been the incidental result of some other image making process, possibly involving a pigment in an acidic medium. I have read about and experimented with as many of the ‘authenticist’ image making mechanisms as I can, and find them even less convincing than the medieval versions. So the short answer is: I don’t know. Yes, to date no one knows or can explain how the image was formed on the Shroud of Turin. But we know that it is a negative photograph and in 14th Century no one had any technology to produce a such an image on 14 feet by 3 feet long sheet with three dimensional coding. And somehow or another, we still managed to turn it back into the authenticity debate again! Remember what Russ said:..
That is the true message from this piece of cloth! Good Evening Daveb of Wellington, The Message Behind The Shroud is one of hope and possibility. One that sheds light where there is darkness, hope where there is despair, faith where there is doubt and joy where there is sadness. Those are all things Jesus did during his ministry and Russ Breault is doing the same. Good, that is exactly what the Lord wants done. Shroud is a witnessing tool. I am 100% convinced of the authenticity of the Shroud. The 3rd being the most convincing. Back to messages, I think there is a message written plainly on the Shroud, an identification mark/message telling us all exactly who the Man In The Shroud is. If you were a forensic detective and came upon the scene of a very brutal murder in which the victim was stabbed 120 times and you came upon this man lying face up and saw what clearly looked like the number 3 written in blood on the right side of that person’s head, would you think it looked out of place? Would you photograph it? Would you measure the blood stain? Would it get your attention & leave you thinking that it was left by the killer, a signature sign? Or would you think by random coincidence the blood coming from a small puncture wound just happened to take on the shape of number 3? The odds of that happening are extremely slim. I challenge anyone in the world to show me a photo of a blood stain that by random coincidence took on the shape of #3. 1. Jesus prayed (3) three times in the Garden of Gethsemane before His arrest. 8. Jesus is 1) Prophet, 2) Priest, and 3) King. 10. During His ministry Jesus raised 3 people from the dead. 13. The inscription on the cross of Jesus was in 3 languages. 18. 3 women and 3 men were present at burial. 24. God’s attributes are (3) omniscience, omnipresence, and omnipotence. 25. God’s essence is that of a Trinity (3) Three in One: Father, Son, and Spirit. 27. Jesus died at the 9th hour (3 p.m.). 29 The NUMBER 3 IS WRITTEN IN BLOOD ON RIGHT SIDE OF MAN IN SHROUD! 30.. The NUMBER 3 BLOOD STAIN IS 3CM LONG!!! Are you serious?! Of course these are all just coincidences they have nothing to do with the #3 bloodstain. That is another thing that just happened by random coincidence, like the distance information. That is not distance information, just incredible luck, some fibers are colored and others are not, some lite, some dark. There was no planning involved. #3 bloodstain was not planned either. 5. People consist of 3 distinct parts: 1) Body, 2) Soul, and 3) Spirit. 8. ELF Waves Around Earth are made up of 3 components. 9. Shroud Fabric is 3 over 1 Herringbone twill fabric, reference to The Shroud in the Bible is 3: 1 Galatians. It’s not a #3 – it’s a sideways lower case ‘m’. Start again…. He knew that we would be going through some of these doubts. It is as if he is signing his name to the Shroud. He is telling us that yes, his dead human body was placed in this cloth and his loving spiritual body came back to the human body so that we will believe in him for the centuries that we are still here on the Earth. Thanks, Emmett. I attended one of Russ Breault’s presentations recently. It lasted about 80-90 minutes. He spent about 5 minutes talking about his faith in Jesus and “the message behind the Shroud”. He spent the rest of the time making a compelling case for the authenticity of the Shroud, much of it based on science, science which the skeptics don’t have the courage to even consider, let alone accept. What really gets me is all this stuff the 1988 carbon-dating tests. FOLKS, LISTEN UP. THE CARBON-DATING TESTS IN 1988 HAVE BEEN DEBUNKED BY NO LESS THAN RAY ROGERS, ONE OF THE SCIENTISTS INVOLVED IN THE TESTS. HE WENT BACK, DID HIS OWN HONEST AND EXTENSIVE RESEARCH AND DUMPED ALL OVER THOSE TESTS. Leon, YOU LISTEN UP (gee my caps lock works too) the case for authenticity is not as air tight as you seem to believe. Please do your homework and read some of the older archived posts here on the blog. The carbon dating has not been ‘debunked’ by anyone. Period. Full stop. Have serious questions been raised about the protocols and sampling? Yes. Does this mean the carbon dating is null and void? Not until the above mentioned questions have been fully answered. Can you show me where Rogers ‘dumped’ all over the tests? If the Shroud ignites and inspires faith, wonderful. This is an inner treasure a believer should cherish quietly, not brag about it to those more skeptical. Skepticism, by the way, is a God given trait as well, meant to save us from the chains of superstition. David: You and I evidently interpret things differently. When human can’t understand how image was created then we need help from heaven. As Christians we are believe in God the Father then we have to believe in his heavenly hosts including Guardian Angels. I believe in Guardian Angels. So Leon I believe you. Oh, Lord, let’s not go through this all over again! Stop it, authenticisti, just stop it. It is a noble middle path. Do carry on, Russ. Skeptics wil never accept or understand the Shroud message because they only care trying to distort the truth and deceive people. It seems nothing will satisfy them as long as the matter under analysis points toward authenticity. Excellent comment from Russ Breault highlighting the spiritual side of the Shroud that some commenters will never reach. Unbelievable. One after the other. That’s three times in a single blog entry. Need I say more? It’s times like this I wish the Shroud was proven a medieval forgery. And I am an authentist! Are there skeptics who will never, under any circumstance accept authenticity? I’d imagine so. Are there authentists who will never accept a medieval provenance. Undoubtedly. But to paint either side with such a broad brush, to allow no room for legitimate skepticism or legitimate (vs blind) faith, is unjust. Blaise Pascal felt that humans had an innate aversion to truth, Freud was a pessimist, also because of his studies on instincts and civilisation, C.G. Jung had no aversion to religion. He only wanted religion to pass through a filter called Psychology. There was one object related to religion that he seemed to have accepted without hesitation, and in this case it did not have to pass through the filter. Partly, because as the founder of analytic psychology he believed that religion was very important for the individual. Tell me folks, which question will finally get answered during future shroud research? 1988 Carbon dating? Or how image was formed? Of course, the carbon dating! It was done by man. Humans makes mistakes. There will be another STURP like research project down the road. Vatican will give in to pressure from researchers/scientists from around the world. Don’t build your hopes. The Vatican might be responsive, but the Turinese are another matter. Check out the prehistory of the 1988 radiocarbon circus. Even Chagas, head of the Pontifical Science Academy, was over-ridden by those in Turin who thought they knew better, but didn’t!